For those that have followed my blog posts in the past, I do previews of homes that, I think, really stand out. 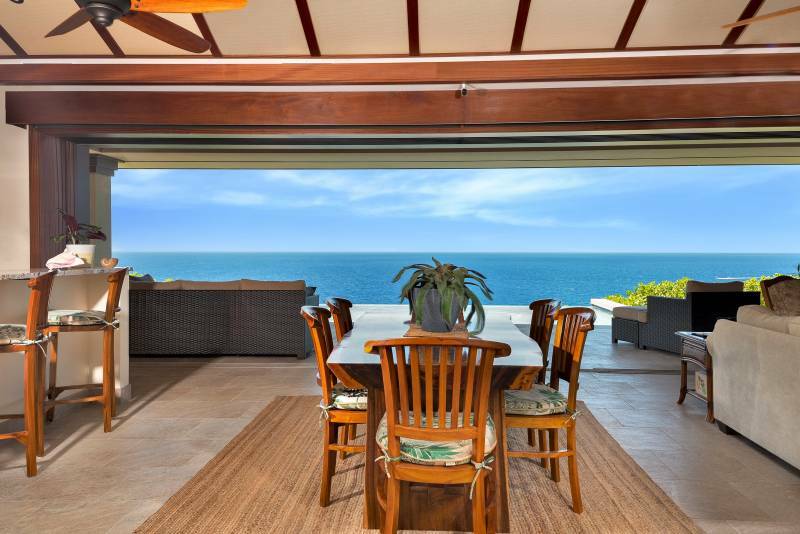 This is a recent preview of a home located in the Kohala Waterfront subdivision located along the Kohala coast. 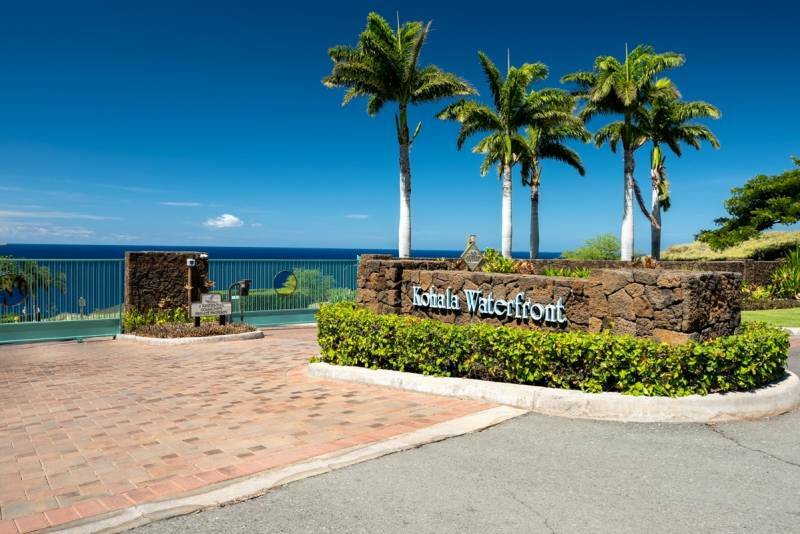 Kohala Waterfront is a gated community of 50 home sites situated on nearly 33 oceanfront acres approximately 2-1/2 miles north of Kawaihae Harbor. As of this writing just under half of the sites have been built out or are currently under construction. 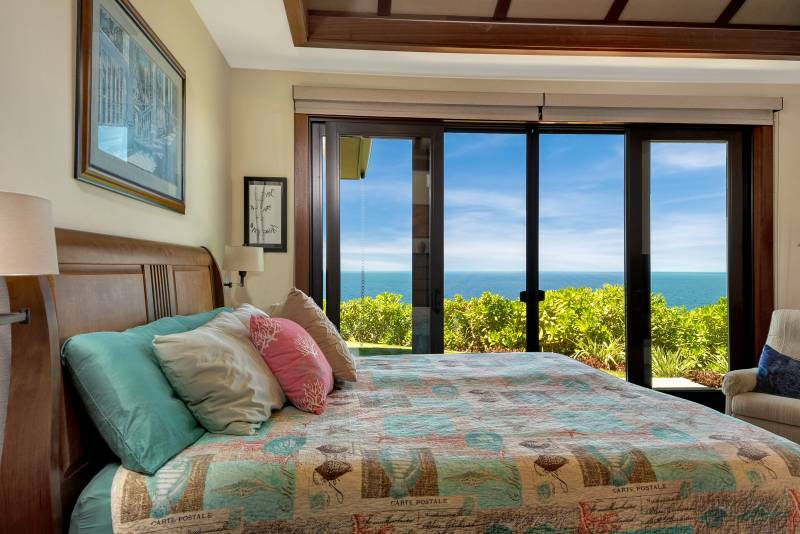 Carefully laid out to take advantage of the natural topography, each home enjoys stunning unobstructed ocean views. Running just above the lava rock coastline of the Kohala Waterfront community is a remnant of the Ala Kahakai trail. Part of a 175-mile long network of trails the Ala Kahakai once connected hundreds of villages and cultural sites across ancient Hawaii. This section of the trail may have very well been traveled by King Kamehameha the Great on his way to the nearby Puukohola Heiau in preparation for his conquest of the Hawaiian Islands. In 2000, the Ala Kahakai was designated a National Historic Trail. For those seeking a secluded retreat to enjoy a premium seat for one of nature’s most spectacular performances, 59-113 Lauhau Pl, is the place. Whether it’s breaching whales, crashing waves, shimmering sunsets or the startling presence of Mount Haleakala looming across the channel, they are all here. The vistas are sweeping and thanks to the sometimes steep and mostly hilly terrain that drops below Akoni Pule Highway, the individual home sites here enjoy a surprising feeling of isolation and privacy. 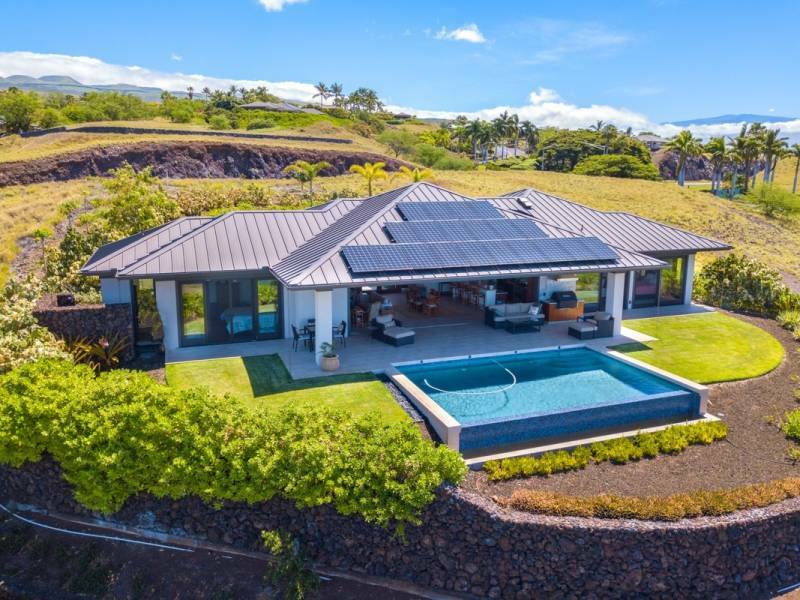 Given all that it has to offer it was not remarkable that on my recent visit to Kohala Waterfront there were only a handful of available lots and a single active residential listing. Fortunately for me, it was a beaut. 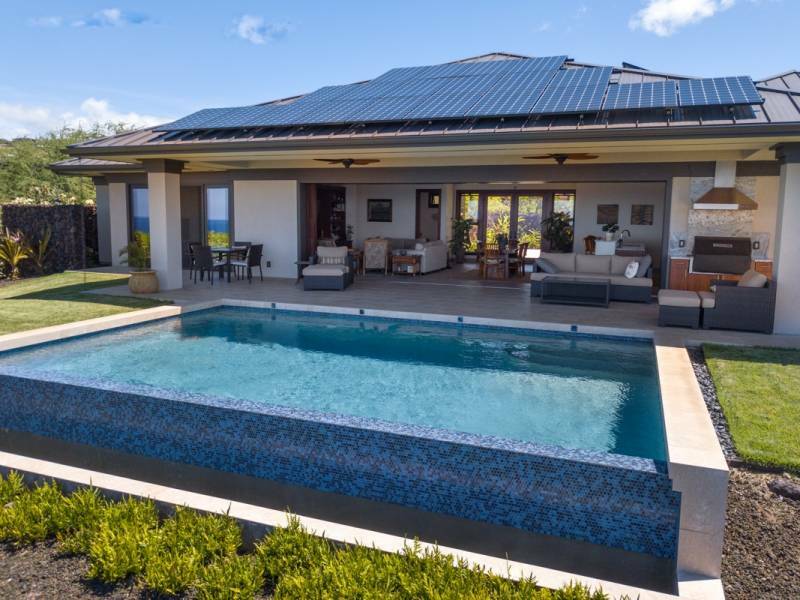 Priced at $3,199,000, this Paul Bleck designed residence has everything you would expect from an acknowledged authority on the Kohala Coast luxury lifestyle. Renowned for his creative solutions to the challenges of the Big Island’s rugged terrain, Bleck has once again demonstrated himself a master in command of his craft. Nestled into the lee of a small knoll the approach to the home drops deceptively from the end of a quiet cul-de-sac and ends at a comfortable turn-around area. With the end of the long curving drive cut into the hill and buttressed by lava rock walls, the house remains virtually invisible until you are nearly at its doorstep. From there you are welcomed into an inviting and airy layout that flows from the open plan great room to every corner of the house. Over-sized eaves and an expansive covered lanai extend this 3-bedroom 2.5-bath home well beyond the officially recorded 2,152 square feet of living space. Fans of Paul Bleck’s signature style will appreciate the massive pocket door system that opens the great room to the over-sized covered lanai creating one uninterrupted space. 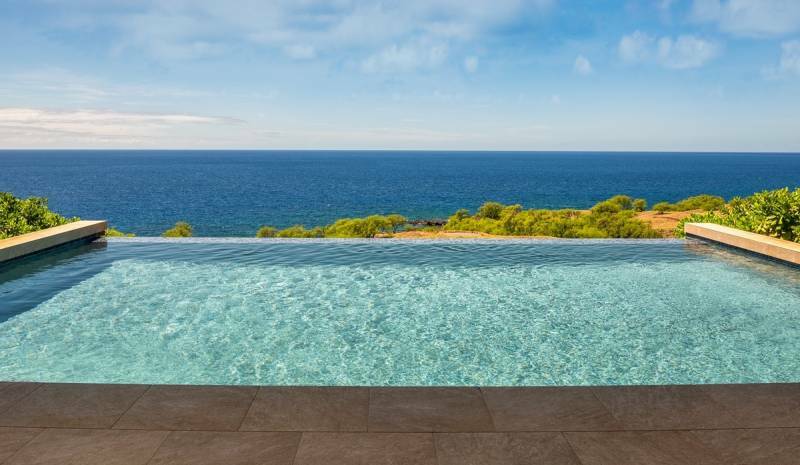 The view across the lanai to the infinity edge pool and the deep blue Pacific beyond creates an uncanny illusion of being adrift in a tranquil sea. No detail has been overlooked in this outstanding residence. An outdoor gas grill and professional grade kitchen appliances beckon the aspiring chef. 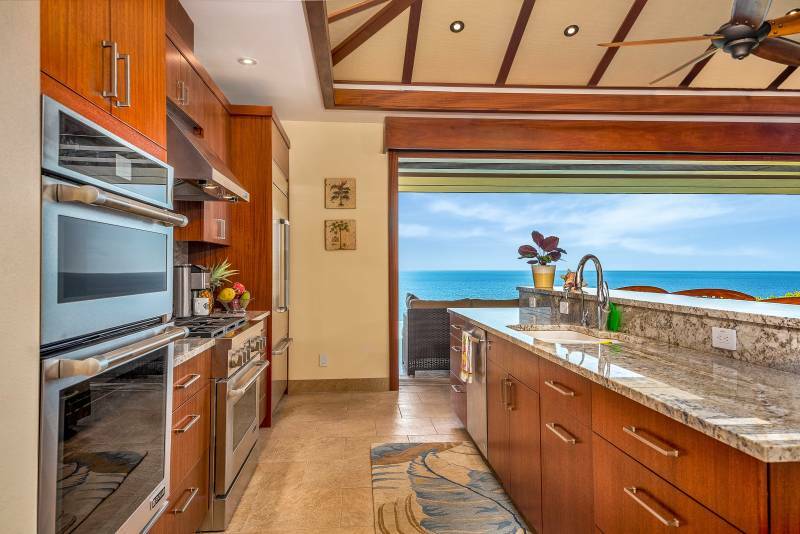 African mahogany cabinets, acacia wood flooring, vaulted ceiling, outdoor shower garden and walk out lanais from both master suites complete the package. Completed in late 2017, the pristine condition of this home makes it a must-see for any discerning buyer. For all of its peaceful character and wild solitude, the community is surprisingly accessible. Whether it’s beachfront dining or perfecting your backhand, all the luxurious amenities at the Mauna Kea and Hapuna Beach Resorts are a mere 15-minutes away. 20-minutes in the other direction could have you zip lining through the rainforest or tuning up your ukulele at the Hawi Gallery. If you venture out along the ancient path you might be fortunate enough to meet a local fisherman. As well as travel the trail served as access to these bountiful waters and native Hawaiians still use the trail to reach their ancestral fishing grounds. If you continue north along the coast a few hundred feet you will reach a small coral beach. On calm days, and there are many along this protected stretch of coastline, you’ll find a mask a snorkel are the only keys you’ll need to open the door to a world you can barely believe exists. Here is a link to the MLS listing, if you have an interest in this home or any of the available lots, please give me a call.